It’s that time of year again: a time of list-making and generosity. This season, I am giving away twelve of my favorite music releases from the year 2014. Call them, “The Twelve Musics of Christmas,” if you will. Today I have compiled a list of my favorite EP’s released in 2014. All this week, I will be giving a copy of each away to lucky winners. But more on that later. First, let me educate the ignorant on EP’s. EP’s, or “extended plays,” are short (3-7 track) albums that artists release to give a taste of a forthcoming album, experiment in a new genre, and distribute bonus tracks to a preexisting album. They can also work as standalone works, among other possibilities. In short, EP’s are mini-albums. Below, in ascending order, are my favorite EP’s of this year. Thumbnail: A welcome, garage rock addition to the roster of great Seattle bands. For fans of the White Stripes, Young the Giant, and Nirvana. Discourse: My Goodness has a stellar sound, and this EP is a perfect introduction to their genius. Their cover of Rod Stewart’s “Young Turks” is pristine. The acoustic version of “Bottle” is gorgeous, and new track “In the Sun” goes well with the hit “Cold Feet Killer.” However, the lyrics aren’t incredibly thought provoking, and their harsher sound will be a turn off for some. Nevertheless, though I haven’t listened to their debut album, Shiver + Shake, it would be fantastic if this sampler is any indication. Thumbnail: Weird, intelligent, experimental rock in the vein of The Flaming Lips, Milky Chance, and MuteMath. Discourse: This EP was a surprise discovery for me and a last-minute addition to this list. Half of the EP is instrumental, and the other half finds front man Ryan Lane rapping/singing/reciting/whatever-ing about the frailty of humanity whilst giving nods to the one who exchanges our ashes for His beauty. 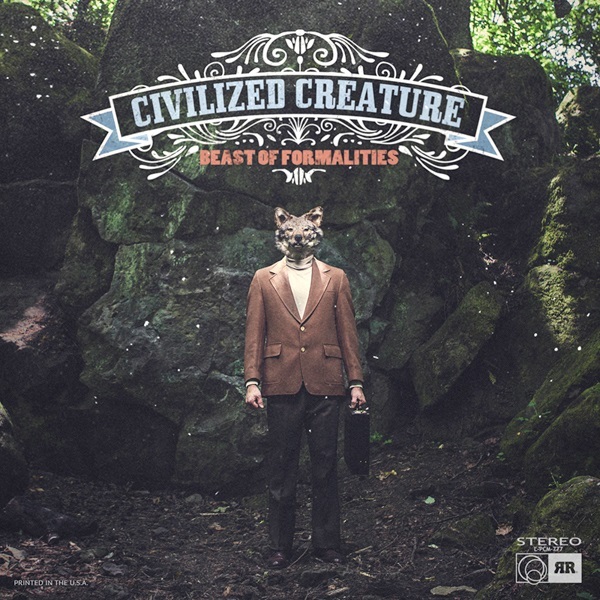 This release won’t appeal to everyone; but if you want a unique and coherent EP, look no further than Civilized Creature’s Beast of Formalities. Giveaway saved for a later date. Thumbnail: Anthemic dance rock that melds the best of Passion Pit, MGMT, and Magic Man. Discourse: FMLYBND (enunciated, “Family Band”) has returned after a brief hiatus to rebrand themselves. They call themselves “electronic grunge,” and that hits the mark dead on. They have a sound fitting for an underground house party (not unlike grunge) paired with danceable synth beats. Lyrically, this EP is on point, but it was a slight disappointment for a returning fan who knew half the songs. For this reason, I will knock down the accessibility a couple of points. Overall, though, FMLYBND has a very promising future. Thumbnail: Switchfoot’s continued development after almost twenty years of music. For fans of Imagine Dragons, Coldplay, and The Killers (though if you don’t know who Switchfoot is by now and really need these comparisons, all I can say is, “Wow.”). Discourse: Switchfoot gets the award for “busiest band” this year. In 2014 they released their documentary, Fading West; an album by the same title; and, later in the year, the EP The Edge of the Earth, which completes the album to form the film’s soundtrack. The Fading West experience was outstanding, and this EP is the icing on the cake. The album and EP, if placed in that order, flow exceptionally well together. There are even a few musical surprises in the 7 song package, including a ukulele, post rock influences, and a beautiful track sung by Tim Foreman. The EP has a hard time standing on its own, but it still is a worthy addition to Switchfoot’s catalog. Thumbnail: Witty, bubbly sythpop with a punch (similar to The Postal Service and early Hellogoodbye). Discourse: Adam Young of Owl City has always been an impressive lyricist, but he often focused this skill on the whimsical and flighty. Now he focuses this songwriting on the reality of struggle, and it is stunning. In the four songs, Adam weaves together heartbreak and hope through it all, even reassuring us that these trying circumstances are beautiful. His synthpop sound is incredibly accessible, and he has returned to form after the somewhat disappointing Midsummer Station, though a newfound darkness in his lyrics may turn away some fans. However, Adam Young is at his best in Ultraviolet. Thumbnail: Synth led indie pop/rock with splashes of 1980’s vibes thrown in for good measure. For fans of Panama Wedding, Kye Kye, and White Arrows. I’m a sucker for indie pop, and I’m a sucker for Benjamin Dunn, so it’s no surprise that this EP topped my list. Ben is a creative beast, and I love the 80’s goodness that emanates from this EP. Perhaps the most praiseworthy element of this EP is its ability to stand on its own. It has a tremendous flow, the songs all working together to form a story of sorts. The Wild Wild’s debut EP is a release to shout-along/sing-along/clap-along with all year long. Perfect for loud stereo systems and days when you’re feeling down. So there you have it! To top all of this off, I will be giving away these EP’s all throughout this week. I will not allow anyone to win more than one EP, but you can enter to win any or all of them. To enter to win, simply comment on this post or the corresponding post on Facebook with the EP(s) you’d like to win and one of your favorite releases from this year. I will randomly select the winners the afternoon following the EP’s Facebook post. So the best way to win without worrying about running out of time is by commenting here. I hope you have enjoyed this post, and I hope the winners enjoy these EP’s as much as I did. Stay tuned for next week when I post my favorite albums of the year and give them away. Hey ej, great post! I’d just like to say that giving these EPs and albums away is such a generous thing to do, and even if I don’t win any, it’s truly amazing that you’re doing this, so thank you. I’d like to enter to win the Switchfoot EP, as I only have the Fading West album, and that would be a great addition. One of my favourite EPs of this year would have to be Cool Currency by The Cowards Choir, which you can get on noisetrade. I highly recommend it. Hey EJ! Put me in the Hat! Thanks Pal! For which EP’s? Or for all of them? Hey EJ. I’m the guy in the videos that you watch on Luc M’s channel. (The funny one lol) Lucas told me to check out your blog and told me that no one entered your last giveaway. I don’t have a blog or anything but I’d like to go in the hat for the Back to Life by FMLYBND EP’s if that’s alright. It’s THE SHERMINATOR!!! Haha, thanks for commenting! And thanks for running with the hat metaphor. I hope you’ll stick around for more posts. You can subscribe by clicking on the menu in the top right corner of my site, and the only thing you need to subscribe is an email address. Hey EJ! You can put me in the hat (is it even a hat?) for the Ultraviolet EP. Great job on your blog man! It is, in fact, a hat. Actually, it’s THE hat. 😉 Thanks for dropping in, Samwise. Howdy, EJ! I’d like to stake a claim in yer Switchfoot and Owl City eppies, if it ain’t too late. As for favorite releases this year, I’ll have to say Matthew Parker’s “Shadowlands” is my favorite because it’s the only 2014 album I’ve listened to (so far). Unfortunately, you are too late for the Switchfoot eppie (I’m totally calling “EP’s” eppies now), but your name is officially in the hat for Owl City. Shadowlands is one of my favorites too! In fact, I am giving it away next week. Hey EJ, it’s me again! Could you please throw my name in the hat for the Wild Wild EP?